Want firmer more youthful looking skin? Tight muscles from stress or exercise? Scar tissue adhesions from previous accidents, surgeries or sports injuries? Then you NEED Endermologie treatments! Endermologie is a non-surgical body-contouring massage, approved by the FDA for the reduction of cellulite. There is no pain or recovery time that you would experience with liposuction. 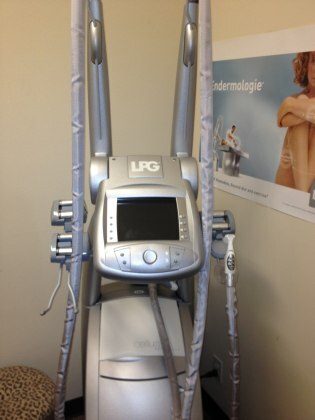 The machine that is used for endermologie (Cellu M6 IP by LPG-see pix) has been acknowledged for its unique treatment approach and its many benefits for health, beauty, sports and wellness. The massage rollers on the machine work to manipulate the soft tissues by lifting, stretching, mobilizing, stimulating and relaxing structures for a myriad of beneficial applications. Your 30 minute session will feel like a deep muscle massage! To get the best results you will need a series of treatments. It is recommend that you schedule 2 times a week for 7-10 weeks, then 1 time a month for maintenance. Some clients may see results within the first 6 sessions, and others may take longer. Series of 14 sessions $1232. Series of 20 sessions $1720.